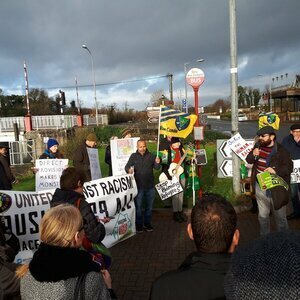 A protest organised by Leitrim And Roscommon United Against Racism outside the Shannon Key West Hotel earmarked for Direct Provision and the target of an arson attack last week. The rally got under way at lunchtime with speaker after speaker condemning the Direct Provision system which is now in its 19th year. Organisers said they want to see an end to the Direct Provision system in Ireland and the manner in which direct provision centres are imposed on communities without consultation. The participants from Leitrim, Roscommon and beyond said they stand in solidarity with the people of Rooskey. There were not many townspeople in attendance. Some feel the events of the past week have unfairly drawn negative attention to the town. Locals say while refugees would be welcome there are not sufficient facilities or services in the village for them. 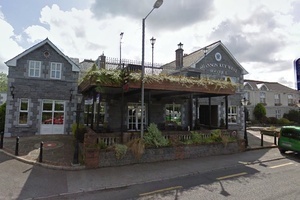 Posted in Misc and tagged Direct Provision, Rooskey at 11:04 am on January 14, 2019 by Bodger. my compliments on this fair and balanced article. The vast majority of media outlets reporting on this leave out this very relevant fact on purpose. Whilst I do not condone or support the arson attack. I am not shocked that it happened. People in relatively rural communities with damn all services don’t appreciate external faceless official’s forcing massive demographic and social changes upon them with absolutely no consultation. I expect that the worst is yet to come, the negative stereotypes of “racist or right-wing” has been used so often that people have kind of gotten immune to it. The trouble came about because an external body decided to make changes in this village and now another external body is coming in to protest against some locals preventing those changes. I wager when the protest was over and the cameras had left 99% of those protesting went home far far away. To the locals. I imagine this is like pouring petrol on the fire. To give a bit of perspective on numbers. Rooskey is seriously depopulated. Something like 13 people live in the village centre! Vast majority present were from adjoining areas of Roscommon and leitrim – from 2 miles down road – from 5 miles down the road – from Carrick etc – hardly an ‘external body’. Two Rooskey born and bred people were involved in organising the event. I see, they burnt the place out to save them from the lack of facilities and services. 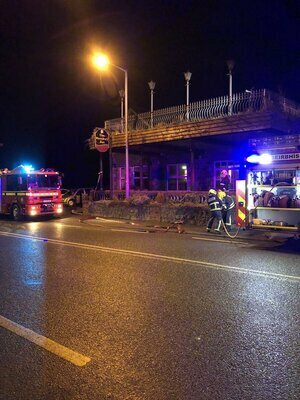 The argument seems to be without the hotel functioning as a hotel it limits the local economy as tourism is one of the few things going in the area. (ii) as above, the ‘concerned locals’ can open their own hotel if they really the town needs one. Although I don’t agree with what happened I will say that the numbers required to keep a hotel open and successful are far more than the numbers that would have kept other businesses in the area afloat. 2nd point isn’t really a point is it? The capital and expertise for this isn’t something that can be acquired by a community effort. It definitely isn’t going to be functioning as a hotel now.